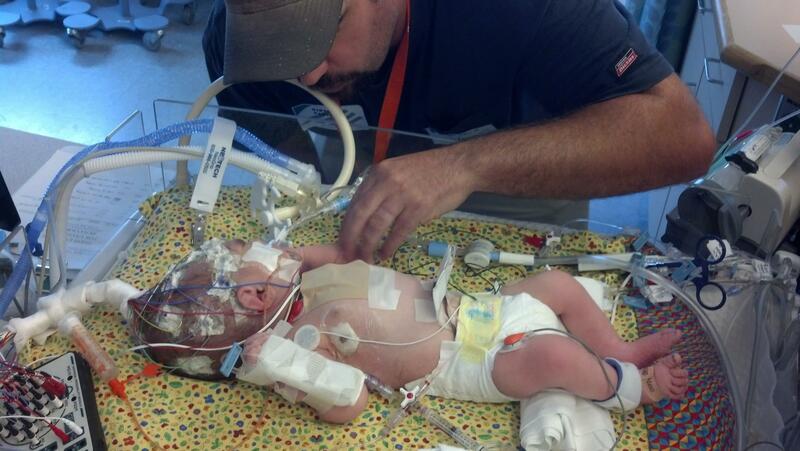 Back in July our friends Mike and Karen asked us to pray for baby Collin. 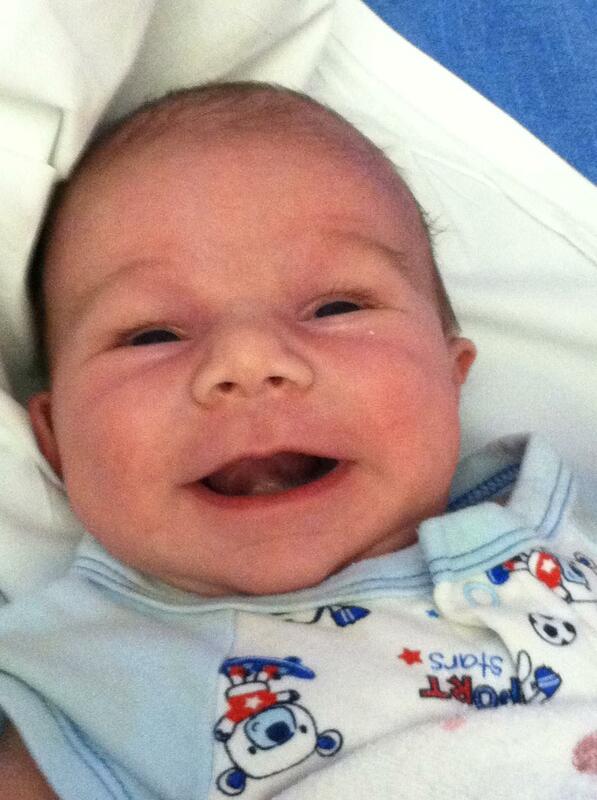 After some difficulties during child birth, Colin had just been born with severe complications. He was born with blood on his brain, and struggling to breath/survive. His life was in serious danger with talk of not making it or at a minimum, they said he would likely have brain damage. We prayed one Saturday while on the streets with our prayer team including several other days with Laury and I individually declaring that the baby would recover fully with no side effects, in the mighty name of Jesus. In fact, there were a whole lot of people offering fervent prayer on behalf of baby Colin and his mother. . This was him in the beginning. This was Collin when released: Yay God! We Were Created in His Image, and He is the Face of Love! Child in womb diagnosed with Down Syndrome, born healthy! Down syndrome pregnancy completely healed! This testimony touched me personally because it’s so similar to the testimony regarding one of my own daughters. In the 1980’s at an early pregnancy check up, late on a Friday afternoon, we were told there were strong indications/results that our daughter would be born with down syndrome. If that news wasn’t shocking enough, it was also strongly recommended by the nurses that we terminate the pregnancy. Wow, what started as an exciting afternoon, came to a screeching halt. I think I literally had difficulty exhaling hoping what I heard wasn’t real. The overwhelming news shocked our world and having drifted from God at the time, this still caused us terrible distress to consider such a harsh recommendation. Even though someone we trusted and respected was strongly recommending termination, and even though such a horrible option seemed somewhat socially acceptable to consider in that decade, I believe the spirit of God deep inside us told us that an abortion was wrong. After four days of what I believe was a “spiritual battle” for our daughters very life, we decided to trust in God and had great peace about the decision to keep the baby. Although I had peace (no doubt from God not my own means), if I’m honest, I can admit it didn’t seem like my faith was very strong back then and I was actually prepared for the worst. I’m so grateful that we had friends who prayed, and stood in the gap with their own prayers and strong faith….so grateful. Today, I’m happy to say my daughter is now a healthy, beautiful, brilliant grown up woman who graduated from Grad School with honors, and currently embarking on her own faith building journey called life…..God is so good!! Steve & Holly’s Healing Steve and Holly Trover waited excitedly for the results of the ultrasound exam that would reveal the gender of the child they were expecting. Steve was elated to hear the report that they were going to have a baby girl. The Trover’s already had two handsome young sons, and in their eyes, the addition of a daughter would complete their family nicely. As time progressed and their three beautiful children, Joshua, Luke and Chloe grew, Holly chose to capture the joy of motherhood by having a professional portrait taken of the children. She had the portrait framed and with deep satisfaction hung it on the wall in their family room. The Trover family was content. 2 years later, in 2008, Steve like many business owners began to see the economy slow. As a result he turned to the Lord and began to seek His wisdom for their business. As he prayed for God’s direction, the Lord began to impress on Steve’s heart that they were to have another child. This was not quite the guidance Steve was seeking. Steve resisted sharing the news with his wife for a couple of months until finally, one night while working at his computer, God said it was time to tell her. Although Holly was completely surprised by Steve’s news, the two conceived their fourth child almost immediately. Several months into the pregnancy, when the time came for Holly to have her second ultrasound, the doctor delivered some devastating news. After careful measurement and calculation the doctor said that there were several factors that clearly indicated that the baby would be born with Down syndrome. The doctor went on to show the Trover’s in detail what led her to the diagnosis. Before leaving the room, the doctor went as far as to talk about possible termination of the pregnancy through abortion. Termination of the pregnancy was not an option for Scott and Holly. The enemy had come to steal from Steve and Holly, but they stood their ground. Drawing on the revelation they had received from Andrew’s teaching in their church small group, and knowing that it was God who spoke to them about having another child, they refused to believe that this was God’s plan for their baby. In the face of this negative report of a medical reality in the natural, Steve, standing on faith in God’s word, took his authority and rejected the diagnosis. “I cancel this diagnosis in the name of Jesus. We don’t believe these things that were spoken over our child and we don’t accept it…” Steve rebuked. Several months later the Trover’s returned to the doctor’s office for another ultrasound. The couple entered the examining room determined to see different results. After a long time passed, the doctor finally spoke and said that if this had been the first time that she had seen this baby, she would have told the Trover’s that their baby was perfect in every way. However, in disbelief, the doctor continued to take measurements. Finally, exasperated, the doctor threw up her hands; she couldn’t offer any explanation for the transformation she saw in the Trover’s baby.